This bok choy recipe is simply excellent, with a flavor that will make everyone want to eat their veggies. Great to serve as a side vegetable dish or add tofu or your choice of chicken, pork, or seafood for a delicious mixed stir-fry dish. With a rich garlic taste, the stir-fry sauce is easy to make, and frying up the bok choy takes only a few minutes. 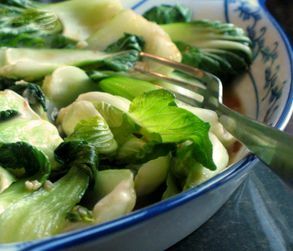 The stir-fry sauce goes well with other vegetables too; try it with broccoli or Chinese vegetables such as baby bok choy, yu choy, gailan (Chinese broccoli), or cabbage. Easy and quick to make, this bok choy recipe will fast become one of your vegetable favorites! Cut off the bottom of each head to separate bok choy into individual leaves. If the white sections of these leaves are very wide or large, you can slice them in half lengthwise, or into thirds. Mix stir-fry sauce ingredients together in a bowl or cup. Stir well to dissolve sugar. Heat a wok or large frying pan over medium-high to high heat. Add oil and swirl around. Add bok choy plus 2 to 3 tbsp. stir-fry sauce. Stir-fry 1 to 2 minutes, or until pan/wok starts to become dry. Keep adding sauce a little at a time and continue stir-frying until bok choy is bright green and the white stems are softened but still crunchy. Taste-test. Add more sugar if too sour for your taste, or more lime juice if too salty. Fresh minced chili or dried chili can be added if you prefer it spicier. To serve, lift out the bok choy and place on a serving platter or in a serving bowl, then pour the sauce (from the bottom of the wok or pan) over. Serve immediately with plenty of Thai jasmine-scented rice. Enjoy! If You Have Extra Sauce: Store in a covered jar or container in your refrigerator for up to 1 month. This sauce is excellent with many different kinds of stir-fried vegetables, as well as with chicken, tofu or wheat gluten, pork, and seafood. Enjoy! Bok Choy Tip: If stir-frying larger bok choy, slice off the green leaf tips. Add the thicker white sections to the wok first, then throw in the leaf tips at the end (these will cook very fast). How Do You Make Easy Thai Stir-Fried Noodles With Vegetables?